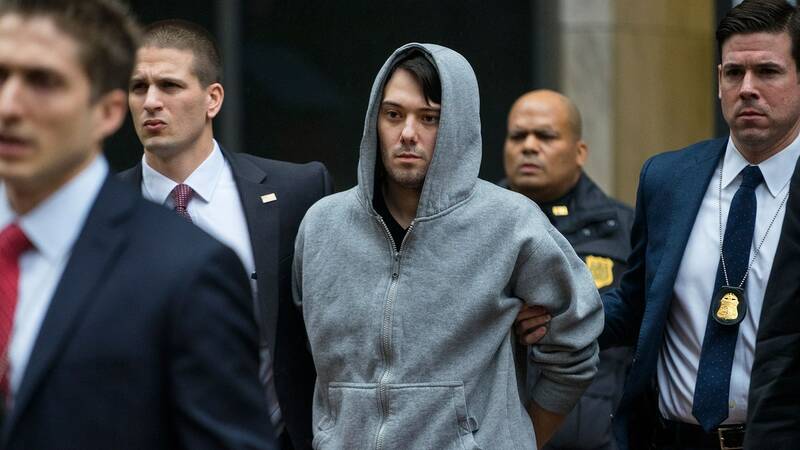 Martin Shkreli, the notorious millionaire most of you know as pharma bro due to his shenanigans when he bought a little known but very useful and life saving drug known as Daraprim and increased the price 5000 fold is going to jail. He was convicted in August of three counts of fraud, relating to two hedge funds and a pharmaceutical company he previously ran. He is scheduled to be sentenced on Jan. 16, when the judge will determine how long he will serve. These are known facts. The ostensible reasons that have been given for his jailing are quite clear: fraud. What is not so clear, or has not been made clear is another even more important fact which is that what Mr Shkreli did when he jacked up the price of Daraprim by 5,000 percent is perfectly legal. Of course, it makes sense for Mr Shkreli’s persecutors to keep that fact in the dark because there’ll be uncomfortable questions to be answered as to why he’s being prosecuted and jailed if what he did is legal. Knowing that what pharma bro did is legal brings us to the next question which is the real reason he is about to be jailed, and that is very simple. If you have followed his case closely, you might have realized this, but most people were deceived by the propaganda machine of Mr Shkreli’s persecutors. You will recall how the only thing you heard about the case at the time was about how greedy and wicked Mr Shkreli was, and how what he did would affect and possibly kill people who needed the drug. As you will also have recalled by now, there was absolutely no mention of the fact that pharma bro broke no laws when he jacked up the price. Yes, it’s perfectly legal to jack up the price of any commodity for which you have sole commercial ownership, and that has been going on for ages. Yes, pharma bro was not the first person to do it. He was just the first to draw attention to it by putting that ridiculous price tag on his own commodity. He attempted to shine a light on an evil that has been going on surreptitiously, but was shouted down by the attack dogs of the perpetrators of that evil before eventually being silenced permanently. This was able to be accomplished because of the brainwashing that has been executed on the American public through the propaganda machine, or mainstream media as most people call it. The false reporting on the case where no mention was made if the legality of Mr Shkreli’s action, nor or the fact that it has been happening prior to Mr Shkreli doing it. Instead, all the reporting concentrated on painting him as black as possible, in order to get the public’s opinion against him. Of course, they succeeded and Mr Shkreli is going to jail for attempting to expose one of the crimes our laws allow the rich to commit against us. What he did is considered almost as bad as what the jailed hedge fund manager, Bernie Madoff did when he had the temerity to target the rich with his ponzi scheme. As in the case of Mr Madoff, what Mr Shkreli did has been going on for ages, and is still going on today, but ordinary people have always been the target. He did it to the wrong people and paid the price. Mr Shkreli didn’t actually target rich people, but he tried to expose a scam they have been running in the shadows. He is about to find out, the hard way, that it’s not very wise to try to fight the establishment on behalf of the American people. That is because the people have become so dumbed down that they no longer possess the ability to reason, and will more likely applaud the persecutors as they destroy you. My point is that, before you go celebrating the incarceration of pharma bro, and exulting in how much he deserves what has come to him, spare a little thought for the “crime” he committed, and if anything has been done to stop it from happening again. What you’ll find is that absolutely nothing has been done, and that it is still happening as we speak, just that it has gone back to happening quietly in the background where nobody knows of, or talks about it. It is very unfortunate that Americans today depend completely on the media to tell them what to think and do. Once the media says hate, Americans hate. The media says love, Americans love. The ability to ask why has been lost, as well as the curiosity to want to explore beyond the obvious. I heard, just before going to press, that Mr Shkreli has been fast tracked to jail because his bail was rescinded for a tweet he tweeted which was considered a threat to the life of Hillary Clinton. Mr. Shkreli tweeted that he would pay for someone to pluck a strand of hair from Mrs. Clinton during her book tour. Although he later explained that the tweet was a joke, the judge disagreed and deemed tweet enough to violate Mr. Shkreli’s bail conditions which means he will be remanded in custody until his sentencing. Previous Things that make sense in America that make no sense anywhere else. Part 1. Next Why Obama getting remunerated by Wall Street for a job well done is good for progressives.